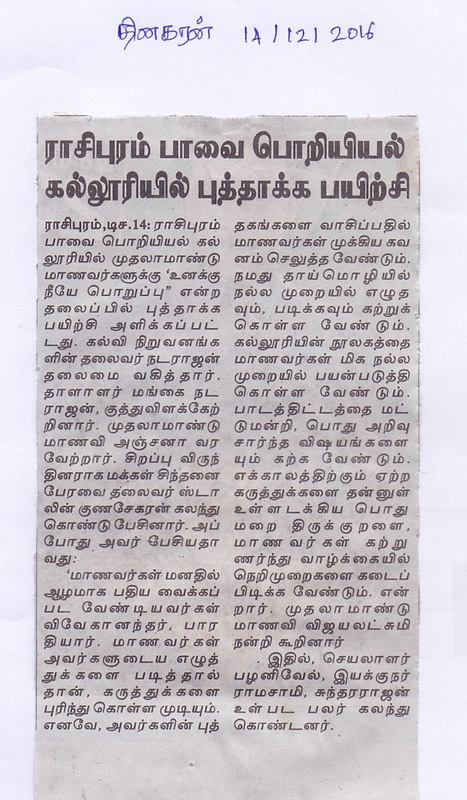 UG Seminar on the topic, 'Open System Interconnection (OSI) Model' was conducted by the Department of Computer Science of Pavai Arts and Science College for Women on 28.03.2019 in Keerthi Hall at 11.00 a.m. All UG and PG students of the Department of Computer Science attended the Seminar. The Inaugural session of the programme started with the prayer song by the students. A.Dhivya of III B.Sc. C.S. welcomed the gathering. Dr.R.Rajeswari, Principal felicitated the gathering and in her speech she said that communication is the most needed skill which should be used only to the required extent. She also discussed the Turing Awards and three Indians who received those awards in fields like Neural Networks etc. She then wished the students to gain knowledge through the seminar and develop a new communication system. She also motivated the students to achieve in their field and to win the highest awards in their career. She then released the CD and the volume of articles presented by the students and Mrs.K.Vimala, HoD, Department of Computer Science received them. G.Madhumitha of I B.Sc. C.S. introduced the Guest Speaker Prof S.Senthilvelavan, Assistant Professor of M.C.A., Paavai Engineering College. The Guest speaker in his special address advised the students to improve their basic knowledge in languages and to be strong in anyone of the languages (Java, C#.net, PHP etc.) He then elucidated in detail the seven layers of the OSI model, which play an important role in communication with real time examples. Soon after the special address, Paper presentation session was held in which 32 students presented their papers in various layers of OSI. The Valedictory function of the Seminar started at 3.00 p.m. The Principal distributed certificates to the paper presenters and appreciated the best four paper presenters with prizes. S. Monika of I BCA proposed the Vote of Thanks and the seminar came to an end with National Anthem.